In highly competitive industries that utilize fleets as their primary revenue-generating business model, company vehicles and equipment are the largest investments, aside from drivers. As a result, companies of all sizes strive to utilize their assets to their fullest potential. Since the late 2000s, more and more companies with fleets have begun to recognize fleet telematics as the key differentiating factor to set them apart from their competition. The use of telematics facilitates progress in terms of improving customer service, increasing fleet productivity and decreasing operating costs – all the while creating opportunities to expand their business. Today, the market is booming with fleet telematics providers. Almost every telecommunications carrier is partnering up with one or more telematics providers to offer their services to business customers. In North America alone, there are over 150 providers for commercial telematics solutions. The Aberdeen Research Group reported that businesses implementing fleet management solutions have reported a 46% increase in their on-time arrivals, and a 13.2% decrease in fuel costs. The benefits of a comprehensive fleet management solution are many, but choosing the right provider is becoming more difficult than it was just a few years ago. Not all fleet management solutions are built the same. It is important to evaluate what you are trying to achieve by tracking your fleet and focusing on finding a provider that will be able to offer you what you need. Does the telematics provider offer only one type of tracking? Many GPS tracking businesses offer only vehicle tracking. Too often, business owners are so focused on improving their vehicle management that they unknowingly overlook the possibility of improving other aspects of their business, such as driver or non-powered asset management, and automating vehicle maintenance or dispatching. Do your fleet managers need to regularly contact your drivers for order status updates? How do you manage your vehicle maintenance right now? Do you have high-value assets like power generators or diesel-powered lawnmowers that are often taken on jobs and have been known to get misplaced or stolen? Are your drivers required to keep HOS logs for DOT/FMCSA/MOT? Do your drivers do regular pre- and post-trip vehicle reports? How do they log defects? How are vehicles scheduled for service? Though there are various solutions on the market that specialize in asset or resource management, this set up would require you to split your operations management into silos. In their recent study “Evolving Beyond Simple Telematics”, Frost & Sullivan – a global research and consulting organization – uncovered the emergence of the new generation of mobile resource management solutions, also known as Telematics 2.0. They also discovered that 46% of business owners surveyed already have, or plan to deploy fleet telematics systems, while 57% have implemented a plan to introduce mobile asset tracking. What are some of the key values when choosing a GPS tracking partner? You have done your research and selected a few providers that offer you the features that your business needs. This is only part of the package. It is important to evaluate the level of on-going support the partner will be able to provide for the length of the contract and beyond. Signing up for a fleet management provider is a commitment of at least 2 years. To err on the side of caution always inquire about Month-to-Month options or Early Termination Fees. If the company is confident in their ability to provide you with great service, they should be clear and concise about their offerings and terms. Training options, support availability and a range of other services like a fluid implementation process or the ability to provide customizations can heavily impact your satisfaction with the chosen partner. Go on a 30-min demo with each telematics solution provider and inquire about their post-sales support. What are their training options? How easy is it to reach technical support? Does the telematics provider offer regional onsite support? In 2018, North America's largest telecommunication network providers announced the retirement of the 3G network. Here is a summary of what it means for your phone and other cellular operations. 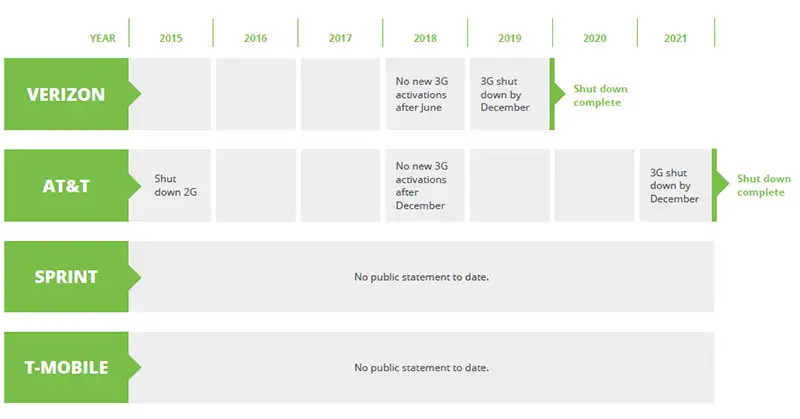 The timeline for the 3G network shutdown may be much sooner for some providers, while others have longer time to phase out the dated technology. Beware of fleet management solution resellers aiming to liquidate discontinued technology at a lower price. You may save a few dollars today, but in a year or two this will cost you in removal of an obsolete product. What is the roadmap for your platform for 1, 3 and 5 years? How do you ensure your solution is operating on the latest technology? How do you ensure your operations are not affected by the 3G network shutdown and what is your migration plan for existing customers? When choosing a telematics partner, it is important to identify the goals that you want to achieve with your telematics device and focus on finding a product that will help you reach those specific goals. Paying for unnecessary integrations or added features, for which you have no immediate plan to implement within your business, can quickly decrease the return on investment and your satisfaction with the solution. Therefore, beware of telematics providers that offer limited training and support options. With the proper level of training, a fleet management solution can become a very powerful tool in helping you significantly improve your operations and lower your expenses. This may mean multiple training sessions for your team and training of new staff, which can add up to a hefty bill if this service is not included in the telematics solution of your choice. Over the last few years, during the ELD madness, there was a phenomenon of ELD and HOS solution provider abundance, with new vendors popping up at an accelerated rate. For fleets and drivers this meant a plethora of choice and competitive pricing. For vendors this meant tough competitive market and continuous investment into improving the technology, which eventually resulted into some solutions falling behind the more innovative providers. After the dust has settled, many drivers and fleet owners unfortunately found themselves with a technology that was quickly becoming dated, and their ELD provider discontinuing their product within one year of the mandate being in effect. (see: "ONE20 ELD closes its doors" and "ZED ELD shutdown"). Verify your vendor of choice is in it for the long haul and will be a reliable partner with continuous investment into the technology for years to come. 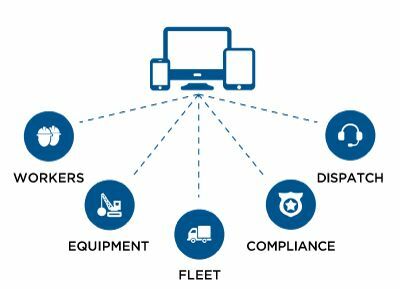 When it comes to integrated technology like fleet management or ELD, deployment, implementation and adoption in the field take time. Save yourself the headache and downtime by selecting a provider that will not leave you on the side of the road. How do they integrate with existing platforms, like accounting, dispatching, fuel management or UBI insurance reporting systems? How often does your vendor release product updates and new features? How long have they been in business and what are their plans for 1, 3 and 5 years? Check out their website's news section to see how active they are and if their business is growing. Want to know what options we have to offer? Purchasing a fleet management solution for your business does not have to be a tedious effort. Consult one of our business solution specialists at BigRoad, A Fleet Complete Company at 1-888-305-8777 to learn more about the benefits of telematics.